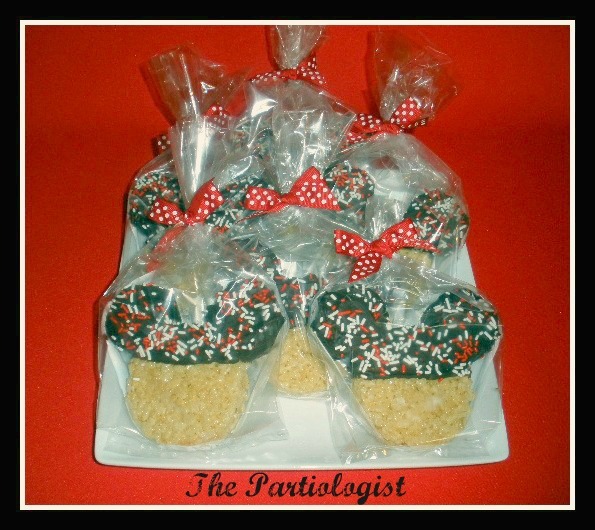 The Partiologist: Mickey Mouse Treats! Let's just say I LOVE the mouse...as in Mickey! And I Love Disney World and if I could, I would go to Disney World every year. But for now I'll just have to settle and make a big box of Minnie and Mickey Mouse goodies for my sister. It all started with the box. 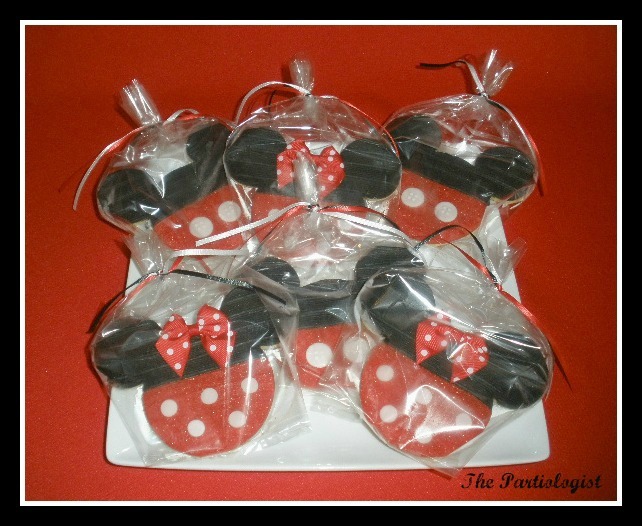 It needed to be big to hold all of these goodies...Fondant topped Minnie Cookies. Yep, they went inside too. 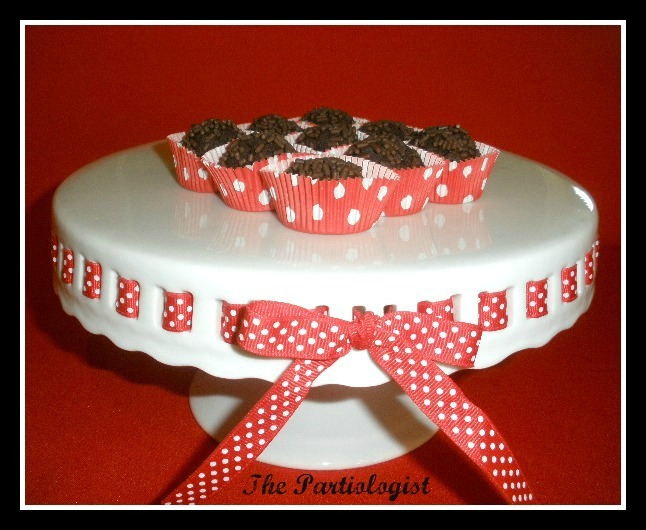 I saved room for some Chocolate Brownie Truffles. 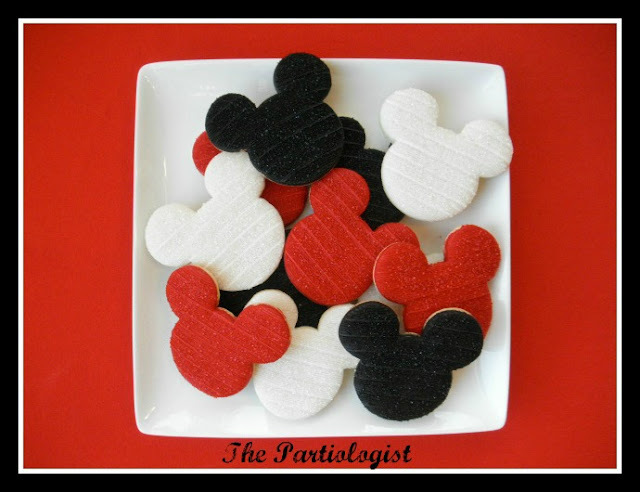 Some sweet little mini Mickey's. 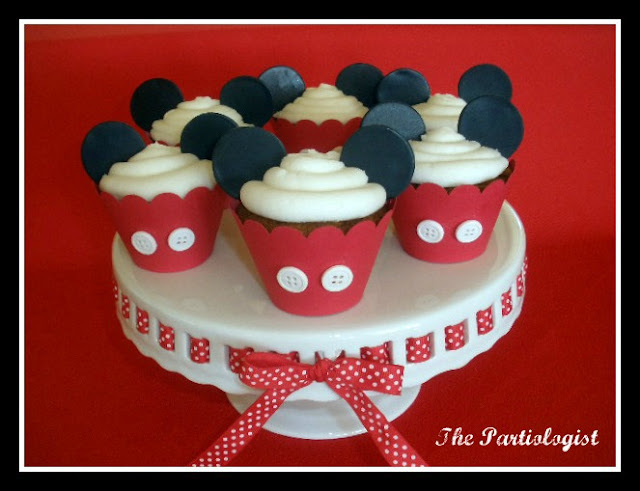 Yep, in they went along with some Jumbo Mickey & Minnie's. 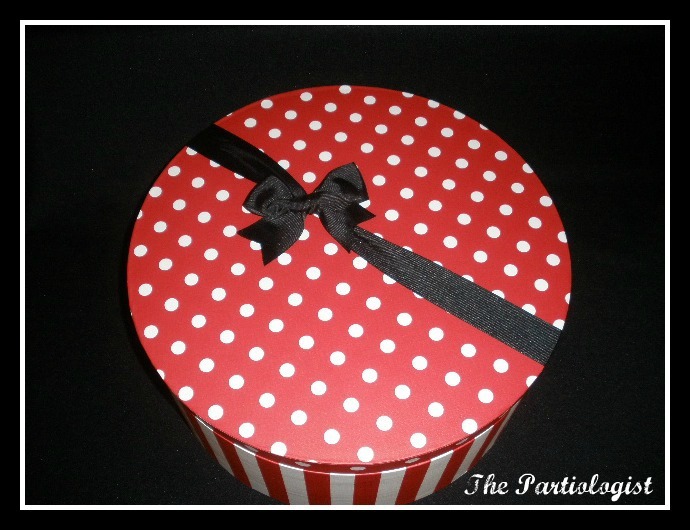 Cute as a Button all packaged up! Almost forgot the Rice Krispie Treats. I always make Rice Krispie Treats it seems. Now here's the really fun part - a Giveaway! A Dozen Cookies like these! Wrapped and ready for a good home. And all you have to do is leave a comment or become a follower and leave a comment and you'll be entered into the drawing. The contest ends at Midnight on January 31, 2012 and is open to all US residents. 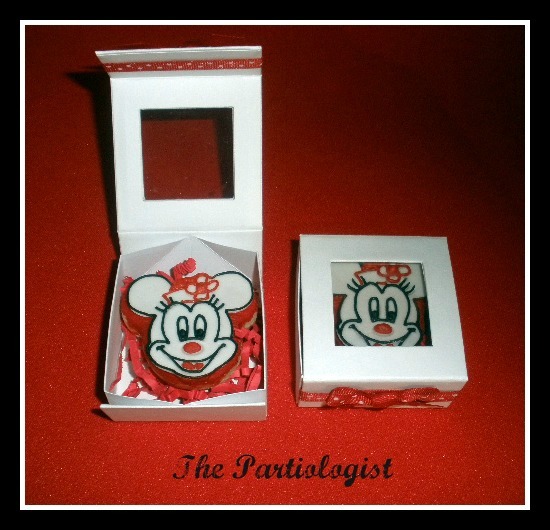 Love "The MOUSE & Love you! Thanks for always making me smile! You are so good at this. I love your detail work. Let's face it... your the best little Partiologist ever. I love Disney World way more then you ..LOL !! It's the best place in the world and really Is where the magic begins at least for me! These are absolutely adorable! 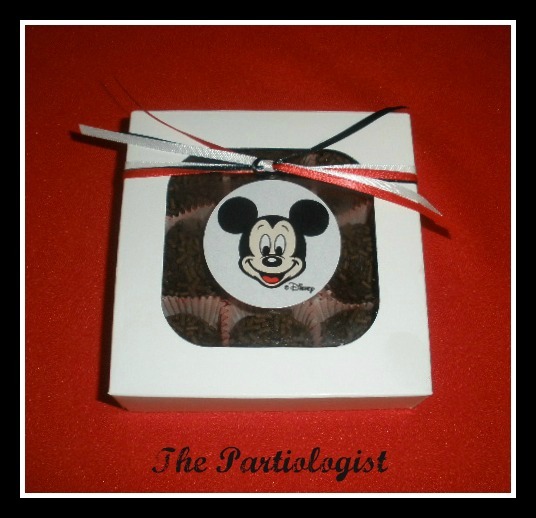 I love the many ways to salute the mouse! How cute is this! I just had a Minnie party for my daughters 2nd birthday! Wish I saw some of your great ideas a month ago! I put my pictures on pinterest if you are interested. Thanks Stephanie - I'd love to see your daughter's party pics! I'll try and find you on Pinterest! You're the best, I do not LIE! Send the for my tum, tum, tum! Once again you never stop amazing me. Everything is pure perfection. You did the magical world of disney proud. Your cookies would sell there like hot cakes. If they only knew what they were missing. We're just lucky your ours. from, twobeautiful girls. I love your work. I know you have your other site, too, for your cookies, but I would love some directions on the how-tos for cookie making. You're actually the inspiration that got me to sign up for cake decorating classes at my local store. I'm more interested in the cookies, but thought this would give me a head start. Thanks again for the inspiration. Thank you so much for your comments! Linda, I am happy that you are inspired to make cookies and cakes! Hopefully someday I will be "blogging" about how to make the cookies. I'm in awe again! Everything is so adorable! When are you going to publish a book? Please do publish a book!!! The sooner the better!!! They are all wonderful! Love the box you put them in - who knew they would all fit in there! Beautiful, fun and makes me miss Disney World! Love how beautiful they are and how delicious they are! Thanks for sharing! You're the best! Kim, I love your website and always look forward to seeing what creative ideas you have. I love Disney World, too, and we are taking our entire family in November. Can't wait! 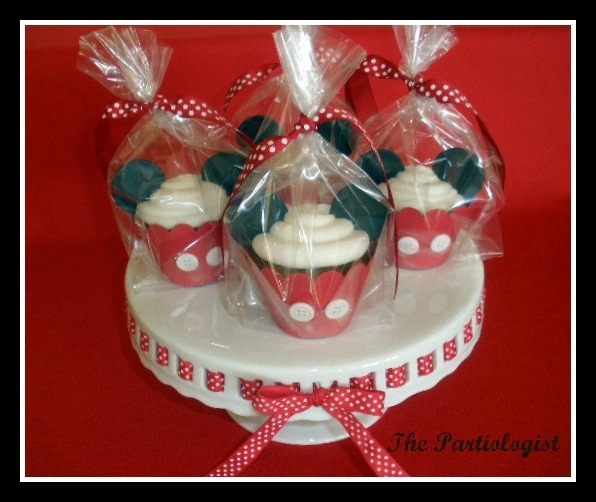 A Minnie party is also being planned for my granddaughter's 5th birthday! Your cookies are awesome! i really love the cupcakes! I am now a follower of your blog by email. 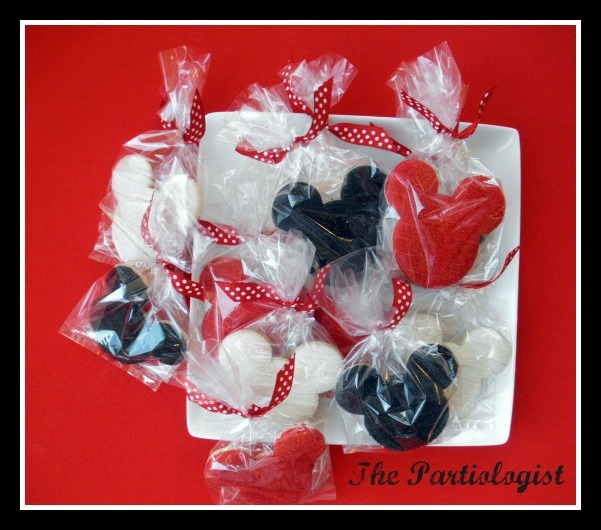 Love your blog and all your Mickey Mouse treats! I hope to go to Disney at the end of this year! The cookies are adorable! Wow!! You fit a lot of mouse in that box! These cookies make me happy just looking at them...oh how I wish I could buy something that delicious when I was at the happiest place on earth!!!!!! I have had these cookies personally...Disney should really contact this lady! Thank you for memory lane today! This is absolutely adorable! 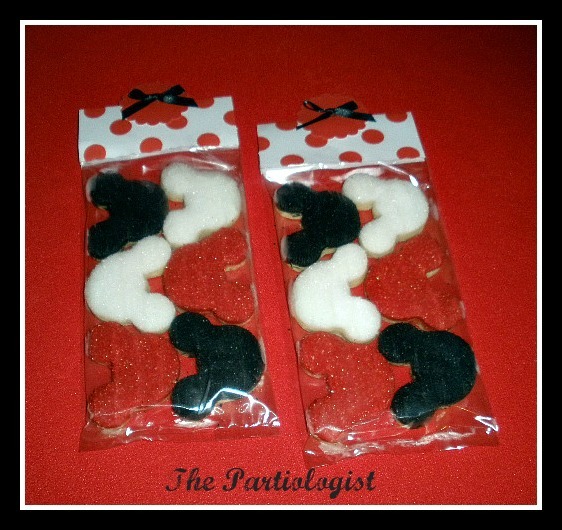 I would love to show these off to my nephew who loves Mickey Mouse! I'd love to take the whole family to Disney...ahh, someday!! That's a lot to fit in a box...it must have been HUGE, not just big! Yea, it was really HUGE! I'm following you on GFC as "Danielle/See Shop Love!" -- Thanks for the giveaway! I can definitely see this as a party!! Just love it. I JUST SHARED THIS PAGE ON MY FACEBOOK WALLBECAUSE IS AMAZING!! I DREAM OF BEING LIKE YOU SOMEDAY....I GET SO INSPIRED BY YOUR WORK! YOUR DESIGNS GO TO MY KIDS SCHOOL EVERY HOLIDAY. THIS BOX WOULD MAKE ME AND MY KIDS VERY HAPPY....HAVE A BLESSED DAY!!! Oh how sweet to share this on your facebook wall! Thanks! I love how you use the sanding sugar! They look so pretty. What a generous gift. Thanks so much Cristin - I really have blonde hair, but I loved the logo. Read more in "About Me"! These are wonderful!!! My daughter would love them! Fingers crossed that I win.. I love all of your Disney treats! Always enjoy reading your blog! Every single one of those treats is amazing! Huge Disney fan over here too! Crossing my fingers! Oh my goodness!! That box of goodies is absolutely adorable!! My family of Mickey and Minnie loving kiddos would just LOVE to munch on some of those cute treats! love them! i love the sparklies! OH MY GOODNESS! I LOVE THESE! These would be perfect for my daughter's third birthday in another month! How cute! 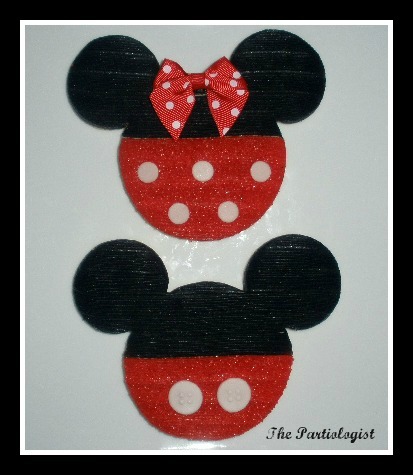 I love Mickey, Minnie and DisneyWorld, too! I am following you and I love Mickey Mouse!!!! i can never say no to cookies especially your beautifully decorated cookies:D I'm already following you Kim! I'm following as Ode to Inspiration but leaving this comment with my Google acct...for some reason I have problems leaving comments for Blogspot blogs with my Wordpress ID. I love love love your talent and the fact that you share it all. 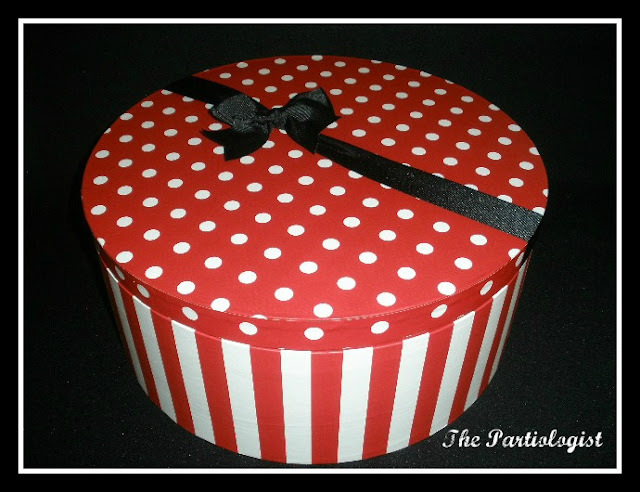 I would love to be entered in your give-away. If I win and don't answer, please be patient, we are off to Hawaii until the 20th.....I'll get in touch as soon as I get back. I know, someone has to keep the visitor numbers to Hawaii and so I'm doing my part. I don't care if the cookies are "old". Thank you so much Lexy! If you win, I will for SURE hold your cookies til you get back! They'll be in the freezer for you so they'll stay super fresh! LOVE all the treats!! So many adorable ideas!! Thank you so much for the giveaway! They are tooo cute and I want them!